can someone help me with manual timer please ? You just move the pegs to the hours you want. Not sure what happens if you get a power cut. Does the over ride switch work ? You have turned it off twice. I guess the over ride in on. Looks like you put the 2am peg in the wrong place.? The top pic its on the inner row. You have it on outer row. Might not make a difference never used one of those timers. It's a 24 hour clock on the timer, so make sure the pointer is pointing at 19.00 at 7pm, or everything will be out by 12 hours. Also make sure the time is accurate on the timer. The one in the picture shows a time of 06.30 am.so if you took it tonight, it's way out . Sorry mate, just 're read what you wrote. 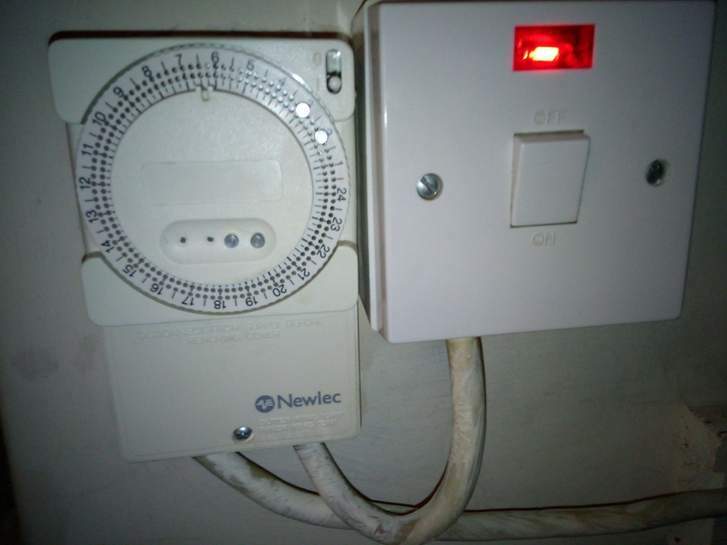 The switch with the red neon light is an FCU which is the mains supply to the timer switch and then to the immersion heater. It's the way you power fixed electrical items. You probably have one for your boiler, washing machine and a larger one for your cooker in your kitchen. It's a 24 hour clock on the timer, so make sure the pointer is pointing at …It's a 24 hour clock on the timer, so make sure the pointer is pointing at 19.00 at 7pm, or everything will be out by 12 hours. Also make sure the time is accurate on the timer. The one in the picture shows a time of 06.30 am.so if you took it tonight, it's way out . 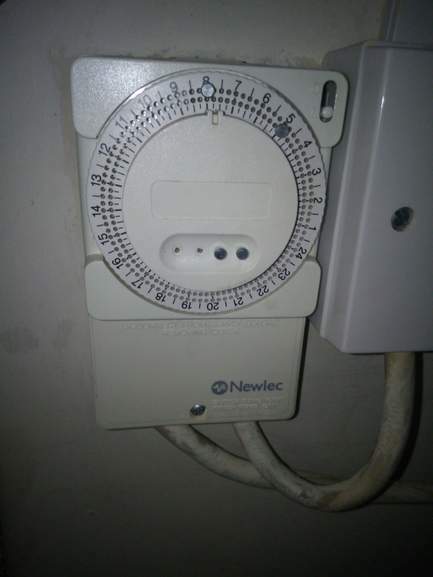 There's normally a mark on the inside of the timer ring (usually at the 12 o'clock position) which indicates the current time, so at the moment the number 6 should be roughly in line with the mark, you can just manually turn the dial to the correct position if needed. It looks like on the last picture you posted the time is reading about 4am, so if you took that picture just before you posted it, it would appear that the clock is approximately 5hours fast. It looks like on the last picture you posted the time is reading about …It looks like on the last picture you posted the time is reading about 4am, so if you took that picture just before you posted it, it would appear that the clock is approximately 5hours fast. Sorry mate, just 're read what you wrote. The switch with the red neon … Sorry mate, just 're read what you wrote. 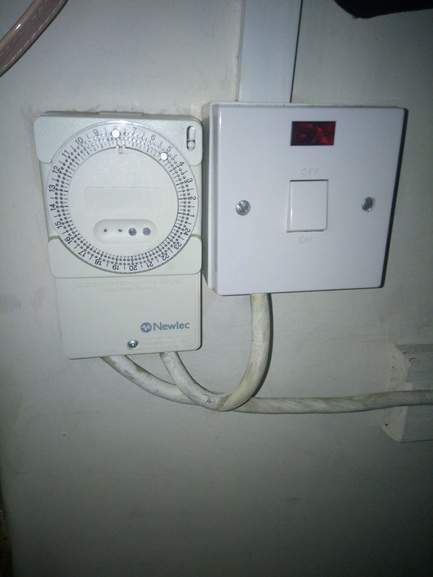 The switch with the red neon light is an FCU which is the mains supply to the timer switch and then to the immersion heater. It's the way you power fixed electrical items. You probably have one for your boiler, washing machine and a larger one for your cooker in your kitchen. It's a double pole spur w neon, fcu? The dial rotates and when a peg passes the mark at the top it either switches it to on or off depending on whether it's on the inner or outer row. It'll only change the state once that happens, if you want to set the current state use the little white switch in the top right marked 0 and 1 (off and on). Not sure if its double or single pole but you're right there's no fuse. So what happens if the immersion fails ? Not sure if its double or single pole but you're right there's no fuse. So …Not sure if its double or single pole but you're right there's no fuse. So what happens if the immersion fails ? It's double pole, cuts live and neutral, it's wrong and should be a fused spur. If it fails it will just take out the mcb in the dis board assuming that it is correctly fused. I am feeling so stupid. 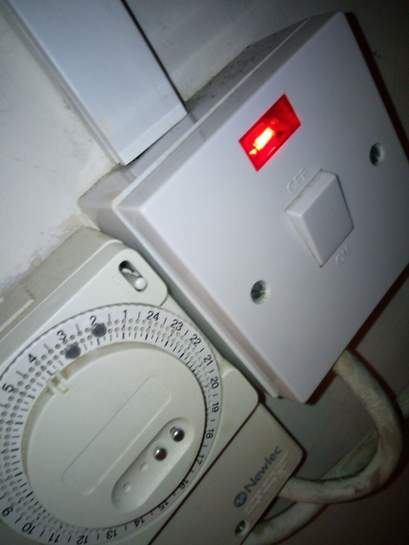 Regardless of which settings I select, as soon as I press button, red light switches on and boiler starts operating, what I am trying to achieve is to run every night at 2am and 3am, would it still turn itself on if button is turned off and red light is off ? Sorry I mis read, I thought that was for a economy 7 immersion heater for your hot tank and not your boiler. Normally your boiler has extra settings. Sorry I mis read, I thought that was for a economy 7 immersion heater for …Sorry I mis read, I thought that was for a economy 7 immersion heater for your hot tank and not your boiler. Normally your boiler has extra settings. Flick the switch so the red light is on, then when the boiler comes on try moving the small white pin at the top right of the timer up or down and see if the boiler turns off, if it does everything is working correctly you just have to adjust the timer clock to the correct time and then set the timer using the peg/pins as described previously and leave the switch on so that the light stays on. Make sure the Switch on the timer is set to O and not to I. If the switch is flipped down to I then I think the heater will come on straight away. Flick the switch so the red light is on, then when the boiler comes on try …Flick the switch so the red light is on, then when the boiler comes on try moving the small white pin at the top right of the timer up or down and see if the boiler turns off, if it does everything is working correctly you just have to adjust the timer clock to the correct time and then set the timer using the peg/pins as described previously and leave the switch on so that the light stays on.